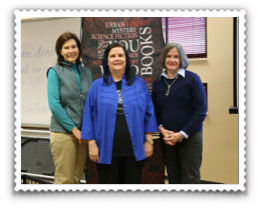 Jana Oliver, award winning YA author, highlighted our first 2014 Schmooze in February: Keeping it Real, How to Write a Young Adult Novel. Her workshop not only bracketed the age group for this ever popular genre, sharing telling detail about teen interests, but delineated some of the subjects that lend themselves to YA. That means writers of YA have to attune themselves to the YA mind set and show the teen’s internal focus through the teen’s often selfish and insecure actions. After all, at best, YA novels not only entertain, they also help teens “try on” a personality -- that of jock, nerd, drama queen -- and help the reader, vicariously, find their place in the real world...a worthy goal of any YA book. Next up was YA author Jackson Pearce. Her April workshop dealt with navigating the publishing world and avoiding wrong, outdated, and confusing advice. From writing the ill thought-out query letter, to finding an agent, to negotiating advances and royalties, she shared her own publishing path to success, pitfalls and all.